Season chicken with salt and pepper. In 12-inch nonstick skillet, heat 1 tablespoon of the butter over medium-high heat. Cook chicken in butter 5 to 6 minutes, stirring frequently, until browned. Remove chicken from skillet. Reduce heat to medium. In same skillet, heat remaining 3 tablespoons butter. Cook onions in butter 5 to 6 minutes, stirring occasionally, until softened. Add tomato paste; cook and stir 2 minutes. Add garlic, gingerroot and garam masala; cook and stir 1 minute. Add pasta and broth; heat to boiling. Reduce heat; simmer 15 to 17 minutes, stirring occasionally, until pasta is just tender and most of liquid is absorbed. Add chicken and whipping cream; cook 3 to 5 minutes, stirring occasionally, until juice of chicken is clear when thickest part is cut and sauce has slightly thickened. 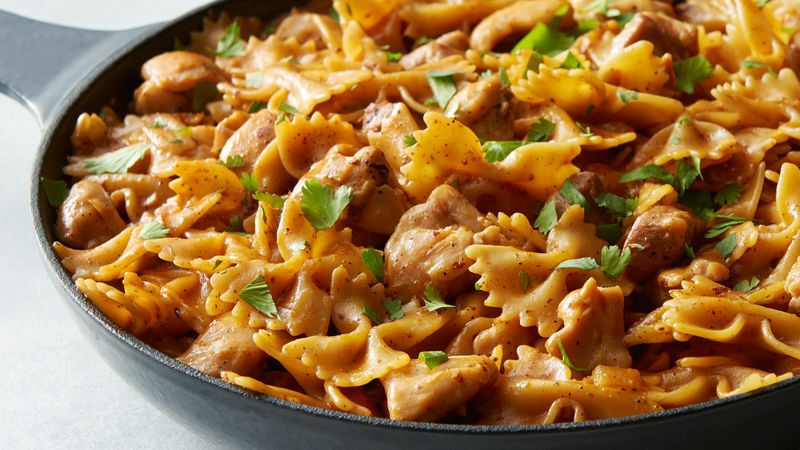 Penne or cavatappi can be substituted for the farfalle pasta in this recipe. Garnish with chopped fresh cilantro or chopped tomatoes, if desired.